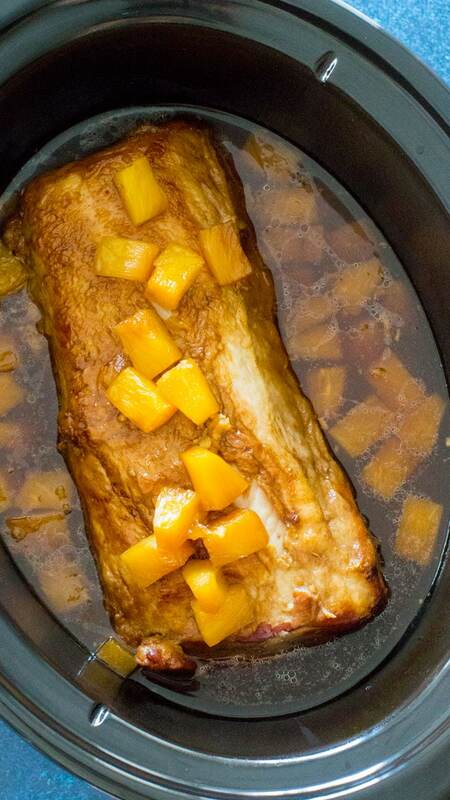 Slow Cooker Pineapple Pork is delicious and tender, all you need is just 5 ingredients. A great family dinner with a tasty tropical twist. 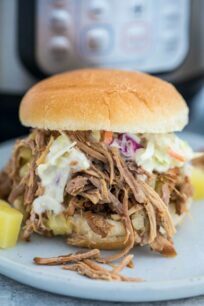 Slow Cooker Pineapple Pork is such an amazing meal, budget friendly, and full of flavor, that is a must try! 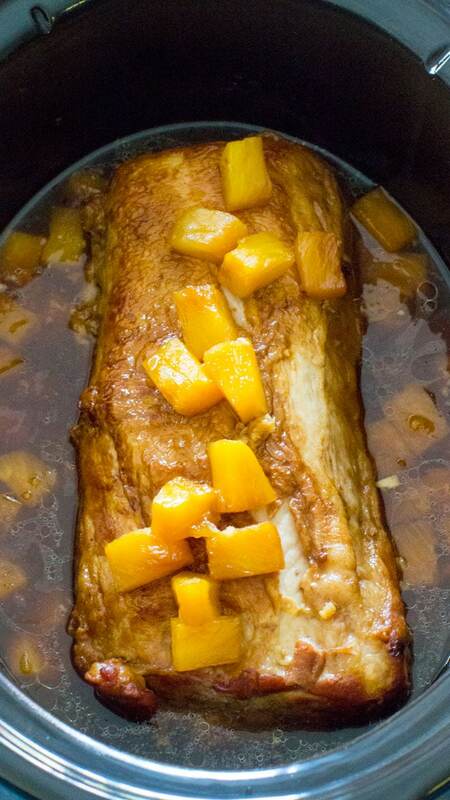 You only need 5 ingredients to make this delicious Slow Cooker Pineapple Pork : pork loin, brown sugar, garlic, soy sauce and pineapple. I prefer to brown my pork prior to adding it to the slow cooker, but you can easily just add all the ingredients without browning. 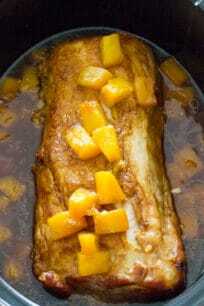 This dish is a great combo of sweet and savory with a fun tropical twist from the pineapple. The brown sugar caramelizes and creates a fabulous sauce with the pineapple juice, that you can drizzle all over that pork goodness. I recommend to serve it with Roasted Rosemary Potatoes, Instant Pot Roasted Potatoes or Slow Cooker Rice and Beans. Firstly, its a very easy to make dish, with minimal prep work. 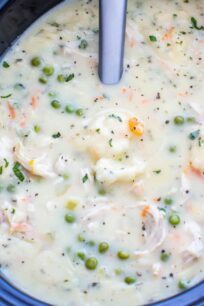 In addition, its a hearty and delicious meal that can be served as a weeknight dinner. Also, the dish is packed with amazing flavors and protein. The main difference is that these are not cut from the same part of the animal, they also look very different. Pork tenderloin is thin and small, while a pork loin is wide enough that you can cut steak-like pieces from it. How do you cook Pork Loin in the oven? If you have time, it will be great if you can marinate the pork loin overnight. Bake in the preheated oven for 25 minutes per pound, or until the internal temperature reaches 145 degrees F (63 degrees C). Make sure you baste the pork occasionally while cooking. Once cooked, transfer to a plate and cover with foil. Let the meat roast for 5-10 minutes before serving. Crockpot – very reasonably priced and definitely a kitchen must have if you are busy. I am a huge fan of slow cooker meals, especially during the school year, when I don’t have as much time to play in the kitchen. Slow Cooker Pineapple Pork is so delicious and all you need is just 5 ingredients. A great dinner with a tasty tropical twist. Trim pork loin of excess fat, season with salt and pepper. Set aside. Heat a large pan over medium-high heat. Add oil, once the oil is hot, add the pork loin and brown on each side for about 2 minutes or until golden. Add the pork to the slow cooker, rub with garlic. Add soy sauce and pineapple chucks with pineapple juice to the slow cooker. Distribute the brown sugar evenly over the top of the pork. Put lid on slow cooker and cook on low for 6 hours, for a soft pork loin, that can still be sliced. NOTE: If you want the pork extra soft, to make shredded pineapple pork, cook it on low for 8-10 hours, making sure during the cooking process, to lift the lid a few times and using a ladle pour the juices over the pork in order to keep it moist. After you shred the pork, add it back to the slow cooker and cook it on low for another hour. 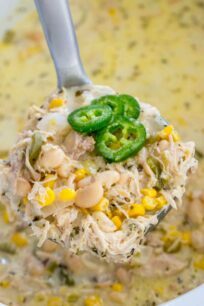 Can’t wait to use my slow cooker all the time again, and I’ll definitely be trying this one! I love the idea of pineapple in this. My boys always request it on their pizza so why not on their pork?! 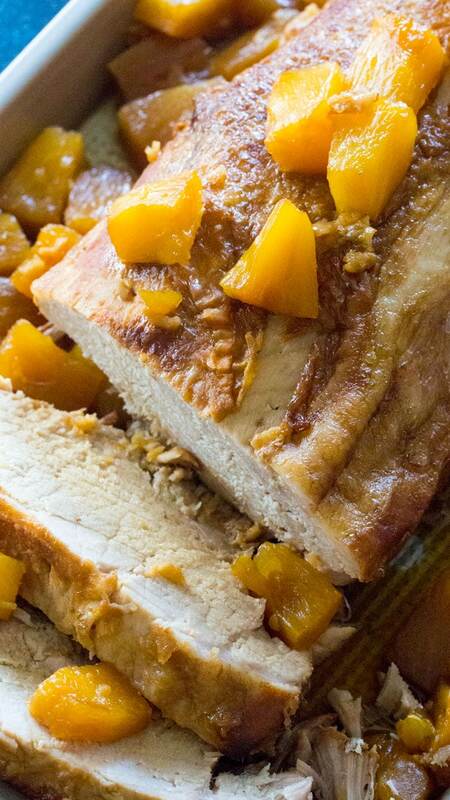 Pineapple and pork are a match made in heaven! I love a nice sweet taste with my meat. Great flavor combo! Never thought of making the pork loin in the slow cooker. Such a great idea!